Do you ever notice a work of art that is composed of several smaller pieces? What about a process that is repeated over and over again within a composition? I'm speaking of artworks that requires the painstaking commitment of repetitive forms to exist as a piece. This motif in design is a lot more common than you may realize, and often holds conceptual meaning special to each artist. As an instructor for the Fundamentals of 3D Design, I teach a lesson on this particular type of art. 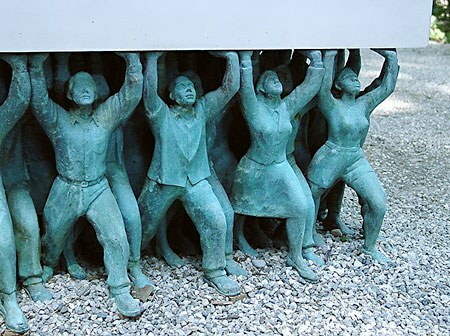 In many cases this can be described as "process art", though the term does not cover all facets of repetition in modern and contemporary art, which includes: Minimalism, Pop Art, Post-Minimalism, Environmental Art, Land Art and more through pieces that exist as sculptural forms, installations, paintings, assemblage, public monuments and fiber art. Yayoi Kusama's life works are primarily composed of her signature polka dot patterns. Kusama has worked in a wide variety of mediums including painting, collage, sculpture, performance art and environmental installations, most of which exhibit her interest in pattern and repetition. 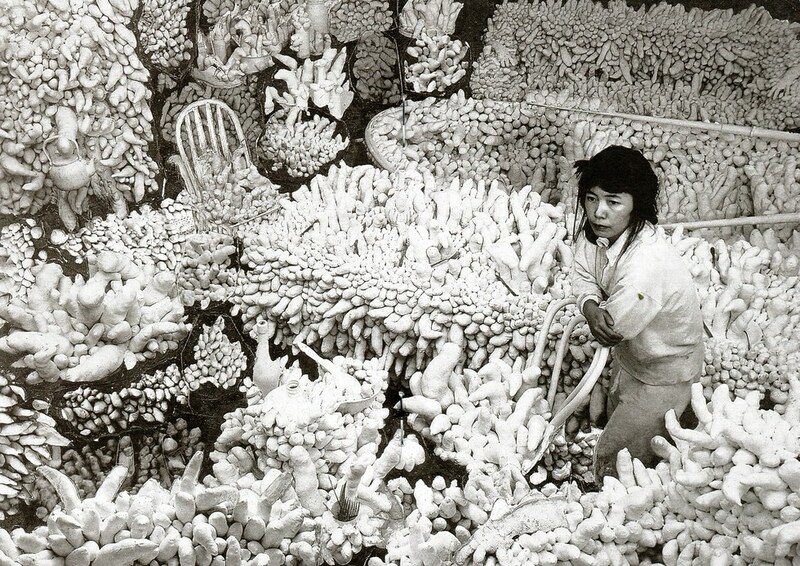 Much of Kusama's work reflects the everyday compulsion and anxiety seeded in her life. As with her installation Compulsion Furniture, the artist obsessively covers pieces of found furniture covered in small, sewn protuberances. Metaphorically, they are interpreted as phalluses, a device with which the artist confronted her own deep-seated sexual anxieties. 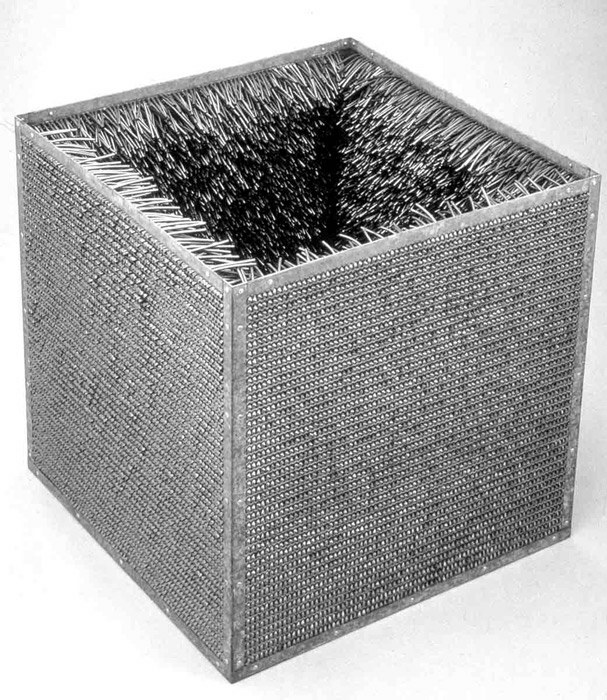 Works by post-minimalist, Eva Hesse, are particularly interesting to those who have a base knowledge of contemporary art history. The works are considered post-minimal because of their close relationship to minimalism. Yet, where a minimalist cube is typically a sleek, closed form that praises the true essence of material purity - Hesse's cube turns that notion on its head. Hesse creates Accession II, an open cube, brimming with texture through interior rows of tubing that complicate its clean, exterior sensibility. Most of her work questions, what is minimalism? What is its opposite? Or with her piece titled Hang Up, she challenges what is a sculpture vs a painting? Mike Kelley, More Love Hours Than Can Ever Be Repaid and The Wages of Sin, 1987. 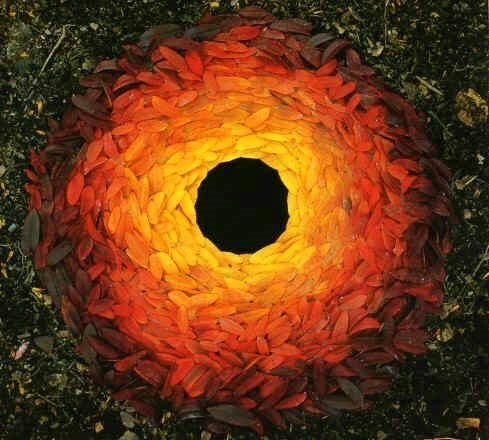 While this piece may not be as striking as some of the others visually, it has a very profound meaning. 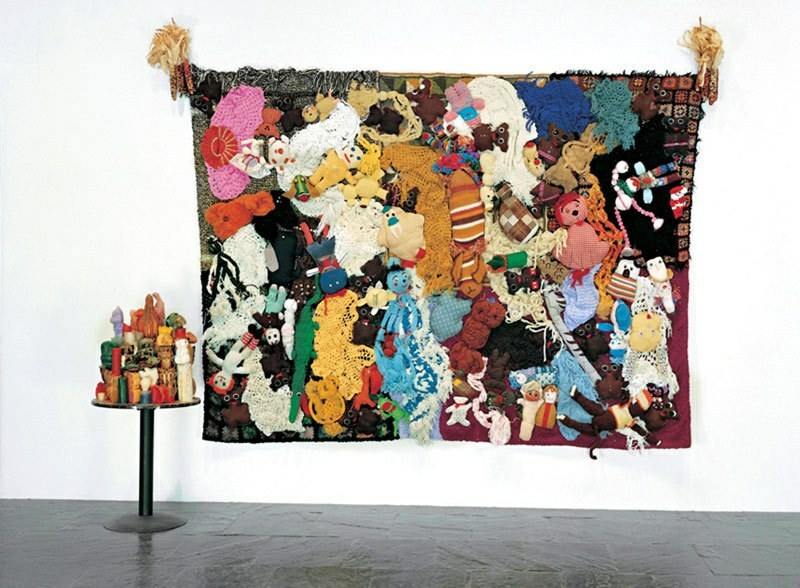 The title "More Love Hours Than Can Ever Be Repaid" explains the concept behind the piece, which is composed of hand-made blankets, quilts and plushy stuffed animals. If each item in the assemblage were made by hand, the hours behind this labor of love could never be repaid. “Repressed memories called into art” is a common theme throughout Mike Kelley's body of work. Kelley held a mild interest in the Superman mythos, what was of greater interest to him was the comic's lack of consistency when illustrating Superman's birthplace and hometown, the bottled city of Kandor. Drastic changes in scale, urban continuity and formal properties such as building type and architectural style can be seen from comic to comic – all variants attributed to the diverse hands of pencilers and colorists detailing and abstracting Kandor over the span of Superman's existence (from the 1930s to present-day). Kelley explained, “Kandor functions for Superman as a perpetual reminder of his inability to escape the past and his alienated relationship to his present world.” Kandor relates to Kelley's exploration of memory, trauma and repression. 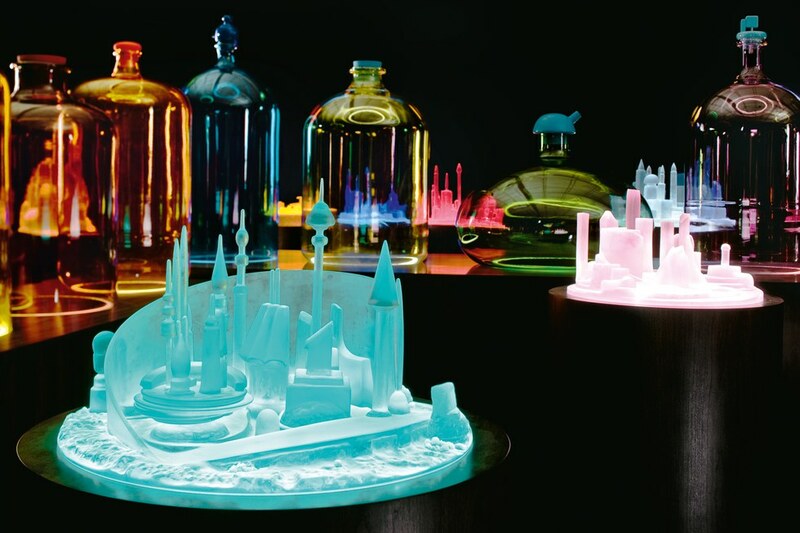 “Kandor as an eternally maintained but consistently reconfigured relic of Superman's childhood” acts as symbol for Kelley's interest in vague memory or repressed memory syndrome. Taking a further look at this repetition and noting Kelley’s interest in Freud, we might also decipher Kelley's repetition of Kandor as a way of dealing with trauma, to reenact a certain scene over and over in order to take anxiety away from it. 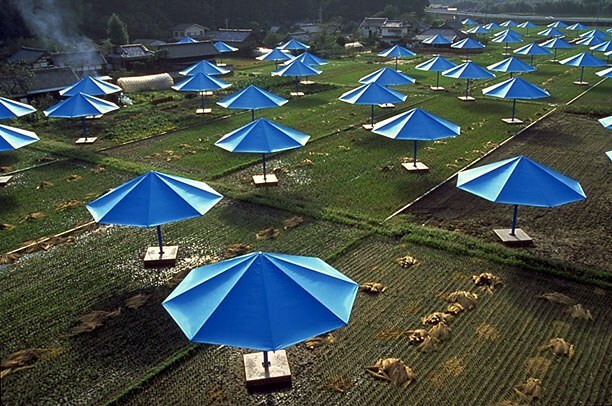 From October 9, 1991 for a period of eighteen days, The Umbrellas were installed in Japan to be seen and enjoyed by the public. Christo and Jeanne-Claude's 26 million dollar temporary work of art was entirely financed by the artists through their The Umbrellas, Joint Project for Japan and U.S.A. Corporation. The pair of artists are best known for their environmental works that span great distances in populated landscapes, both rural and urban. They make these intense, year-long pieces to create works of art for joy and beauty. An alternative reason the couple gave for making this work is to create new ways of seeing familiar landscapes. 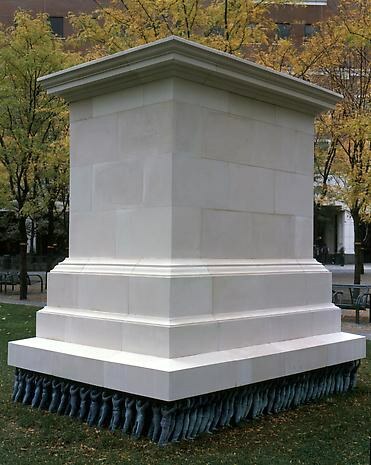 Just looking at this sculpture what might you think the artist is commenting on regarding public monuments? What is unusual about this public monument? Typically, public monuments honor a sole hero among men who stands triumphantly on the pedestal. Instead, Suh shows gratitude for the thousands of men and women who help better their country and make victory possible. This work is incredibly poignant and moving, as proven by its genesis story. The piece was originally intended to be shown in a church in Barbes on the outskirts of Paris which is largely inhabited by an immigrant population. The work was made in response to the stories Gupta read in the news about how soup kitchens in Paris were serving food with pork so that Muslims would not eat it. With this information, Gupta went on to serve vegetarian meals outside the church from hundreds of stainless steel containers. He then went on to use the pots and pans to build this remarkable art piece, Very Hungry God. 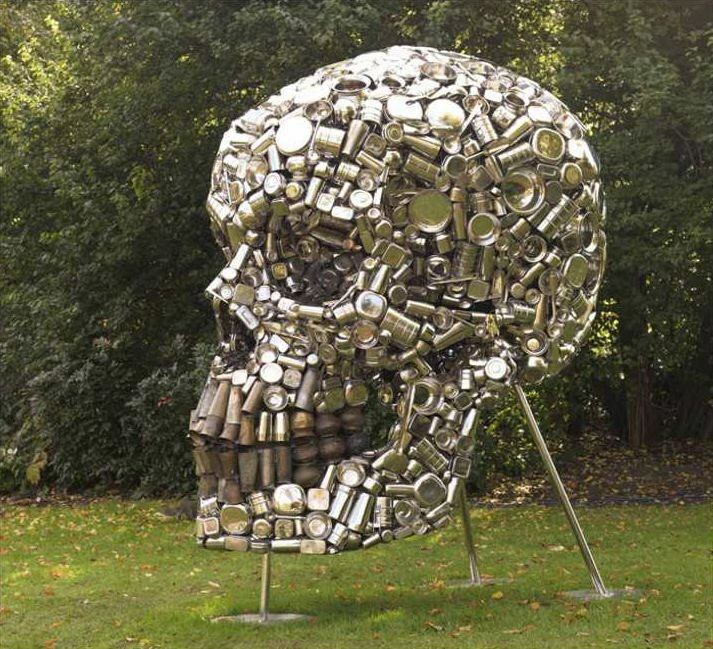 Jean Shin is a contemporary artist working with ubiquitous discarded and re-purposed objects. 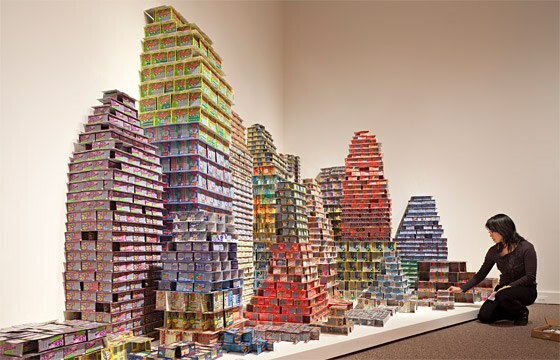 Her piece Chance City took roughly nine years to create because it relied on the collection of thousands of un-won lottery tickets. Chance City is a fragile existence, composed of $32,404 worth of discarded "Scratch & Win" losing lottery tickets built up as a house of cards. The construction is an urban landscape mirroring the thousands of hopes placed on the now discarded scratch-and-win lottery tickets. Aurora Robson's entire artistic practice is based off intercepting the waste stream, from urban environemts to the polluted ocean. Robson pays the unemployed and homeless to help clean and collect the plastic debris used in her work, helping her community in more than one way. 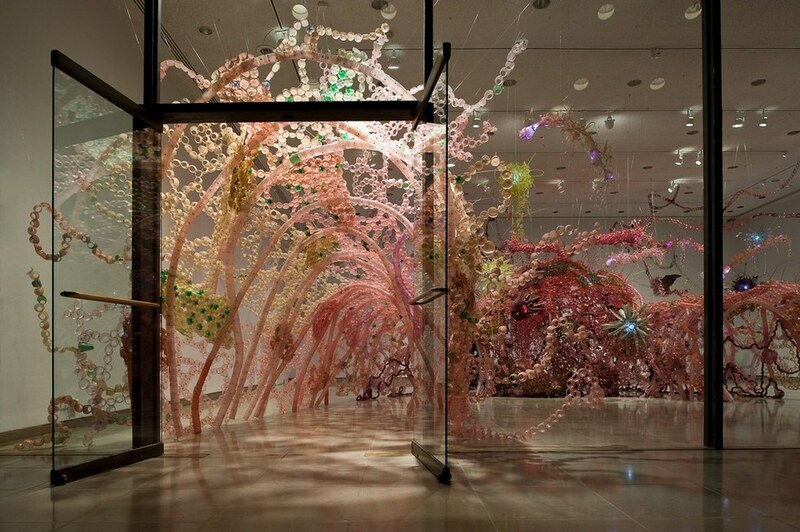 Robson used more than 15,000 discarded plastic bottles and plastic debris in her massive installation, The Great Indoors, a landscape based loosely on microscopic imagery of the human body. The installation is entirely environmentally friendly, composed of her collected debris tinted polycrylic and illuminated by solar powered LEDs. El Anatsui, Earth’s Skin, 2007. Aluminum and copper wire, 177 x 394 in. 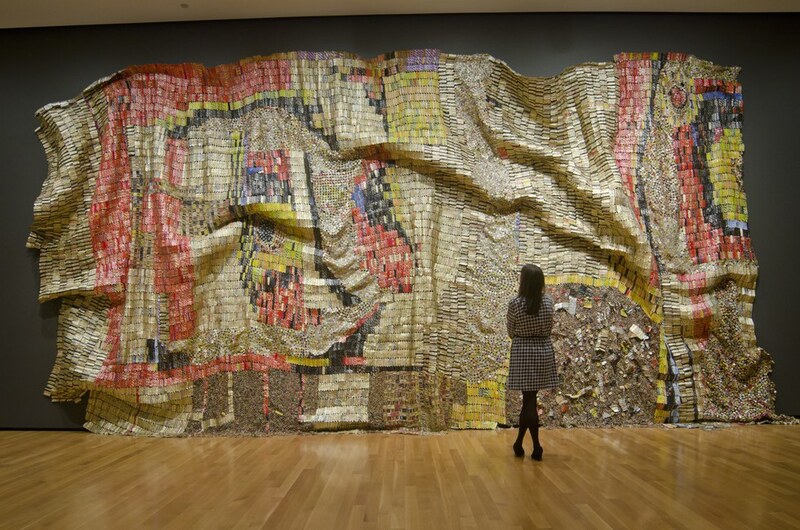 El Anatsui's source material of aluminum waste and bottle-topsreferences consumption, globalization and cosmopolitanism. El Anatsui's iconic “bottle-top installations" are large-scale assemblages made from aluminum and bottle-tops sewn together with copper wire, composing metallic cloth-like wall hangings and sculptures. Customary in capitalism's wake, Anatsui looks to consumerism and waste brought on by colonialism and globalization in his works. 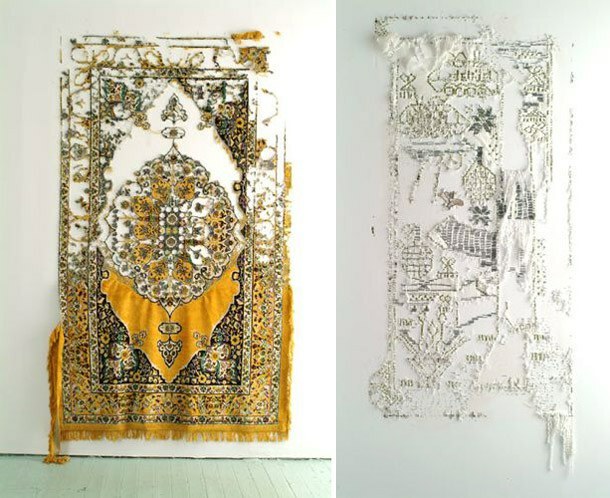 Elana Herzog's work is characterized by the demise of carpets and rugs by means of stapling sections of the rug directly to gallery walls within each installation. The subject matter is common place, found in every corner of the world, while varied in value, spanning from the top designer rugs to those that can be found at Walmart. The rug is a material that connects us as people in all societies and civilizations. Herzog's deconstruction of Persian rugs and carpets began in early 2003, as the U.S. was preparing to invade Iraq. The patterns of the carpets utilized were based on the image of an Afghan War rug made in the 1980s. 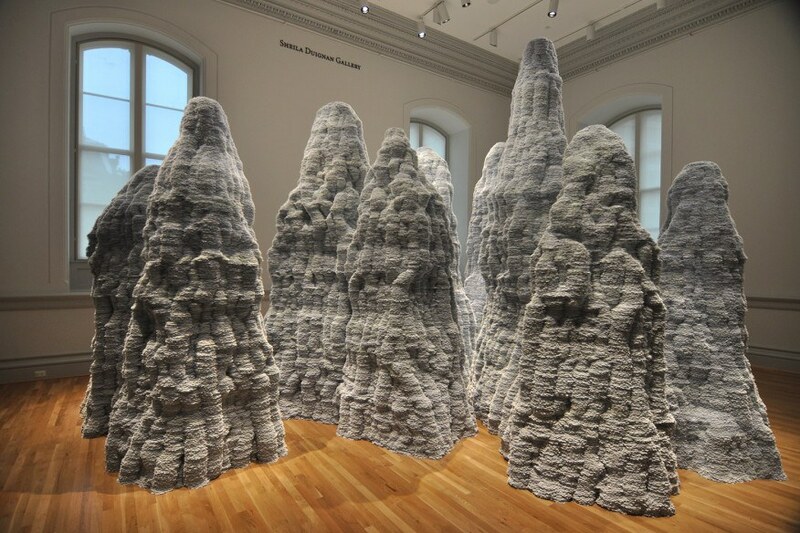 Tara Donovan transforms the ubiquitous and the mundane, using common place objects such as toothpicks, straws, styrofoam cups, scotch tape and index cards to create awe-inspiring works through the process of accumulation. The landscapes created from repeated forms transform the object until it can no longer be recognized. Don't freak out! These insects are long dead (and have died of natural causes), so we can enjoy these bizarre and beautiful intricate patterns, even when they give us the occasional jitters! Jennifer Angus has been working with insects for over a decade. 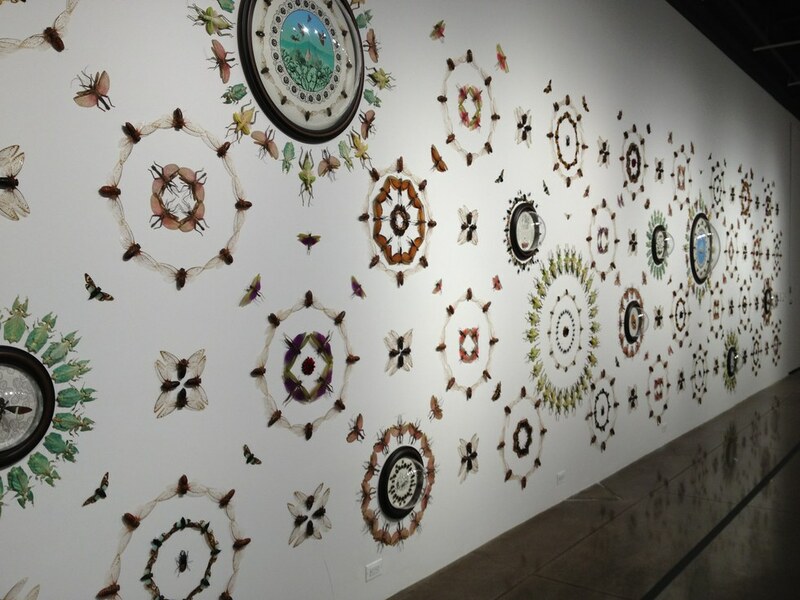 Her art involves pinning thousands of exotic dried insects to gallery walls in visually dynamic patterns and designs. The species in this installation are not endangered, they are quite abundant, primarily in Malaysia, Thailand, and Papua New Guinea. It seems artists are always looking for inspiration, when other times it just finds them. 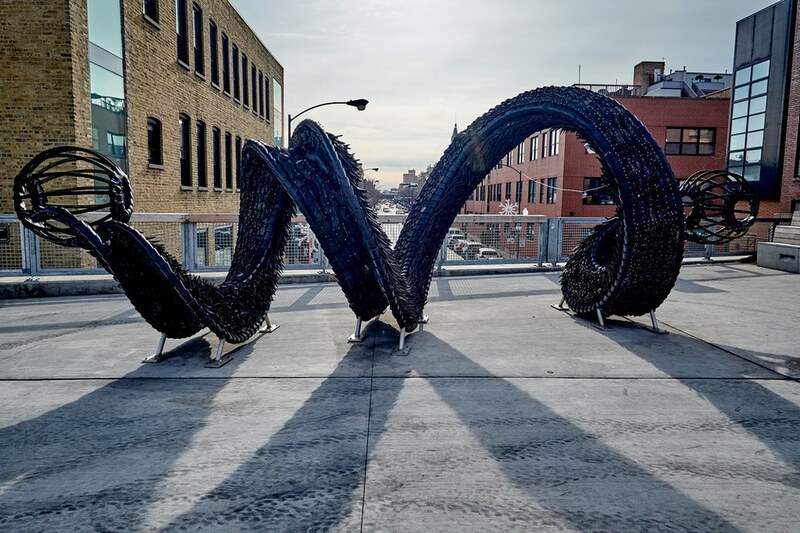 According to artist Chakaia Booker, she was first inspired to explore tires as a material while walking the streets of New York in the 1980s where this source material littered the urban landscape. 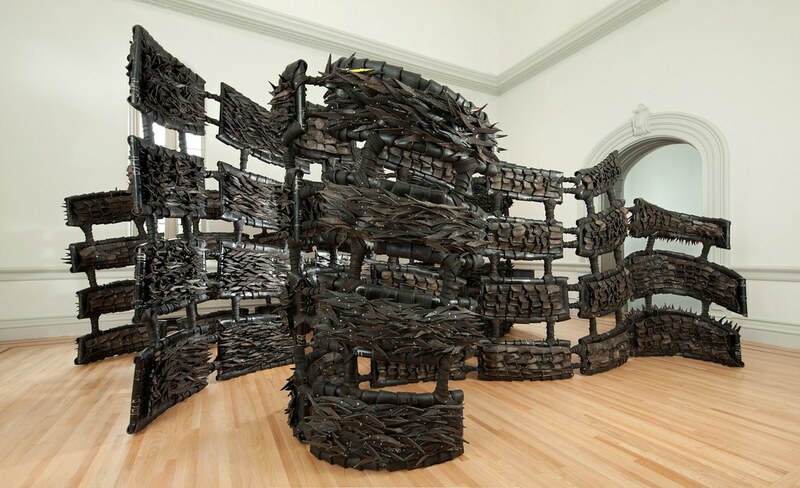 These discarded tires and melted pools or rubber seemed promising to her, and she's been composing incredible works from rubber tires ever since! Booker's Brick House can be found on Chicago's elevated trail, the 606, at Damen. Millennium Park is also exhibiting six recent sculptures Booker in a new exhibition in the Boeing Galleries - running now through April 2018.